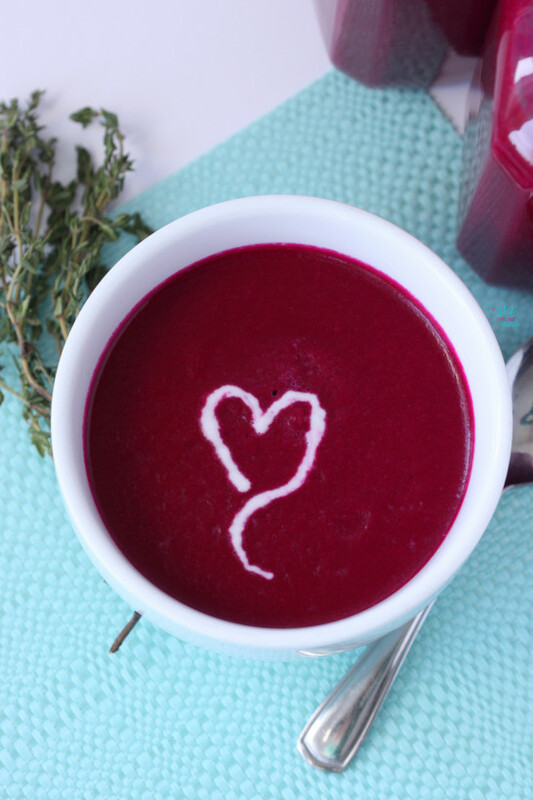 Beautiful Beet Soup on the go! Today is Monday, Meatless Monday! That means I’m linking up with my co-host Deborah, as well as many other great bloggers to bring lots of delicious meatless creations! I can’t wait to see what they whipped up for this week, you can check them out with me at the bottom of this post. I am very excited about the recipe I’m going to share with you this week and hope it inspires you to eat your veggies and add this delicious quick and easy plant-based soup on your menu this week! Ahh beautiful beets, they always hit the spot and cheer me up! I know crazy to have such a love for a vegetable but they are so delicious and colorful they make my heart skip a beet! 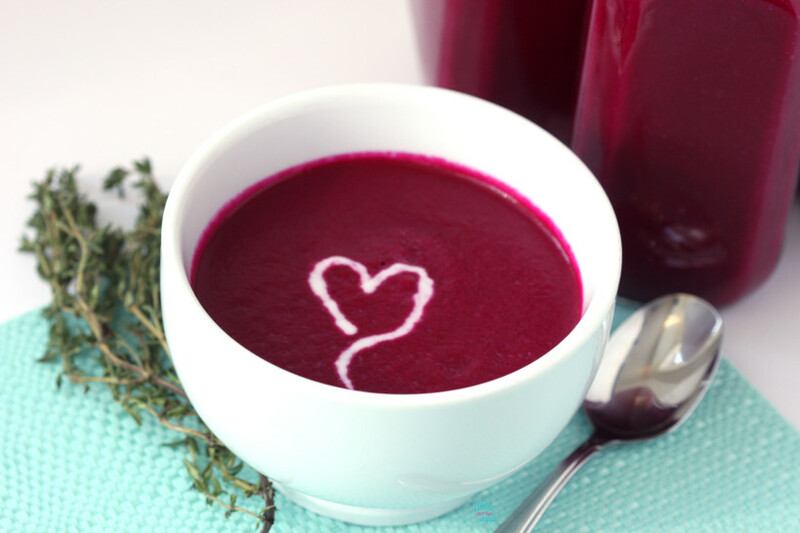 Beet soup is simply delicious and really hitting the spot on these cold winter days. Sitting in my chair all snuggled up trying to get caught up on posts and some lesson plans for the two talent development classes I’m teaching at A’s school, sun shining in the window while I watch the pretty white snow fall and sip on my Beautiful Beet Soup. Yep sip as I’ve been drinking it more often then eating it with a spoon, especially while working on my computer. On days when I don’t want something warm I enjoy this soup cold, so I’m sure it will be on repeat this summer! First you will get sucked in by how bright and beautiful this soup is. 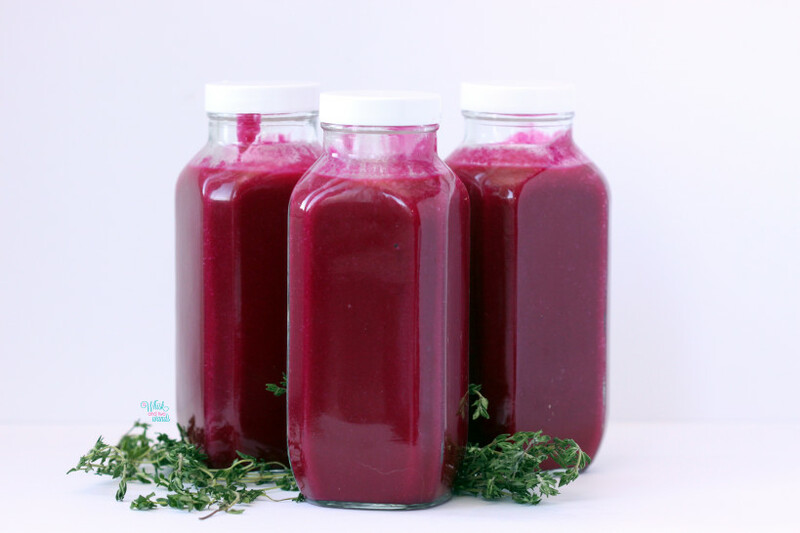 Than the flavor, oh the flavor, I added in pear but only one as it balances it out nicely but isn’t sweet but isn’t a strong beet only flavor and with the coconut milk makes it so creamy, than the fresh herbs oh I could sip it all day long! As if that isn’t enough this soup is packed with whole food nutrition that will not only make you feel good but look good. Of course it isn’t a miracle magically soup but if you are one that is trying to add more juices or smoothies into your diet or do one of those juice cleanses this would be a great addition! It is vegan, gluten free, whole food goodness…. THAT’S IT! Packed with fiber and healthy fats (full fat coconut milk) it will keep you full but not feeling bloated like a salad might if you are just starting out on a whole food diet. It has very little sugar, and sugars are natural sugar, and low in sodium when using homemade or low sodium broth and I don’t add any extra but you can if you want. I even like to make it with coconut oil instead, it is also great with olive oil, which is uses very little just enough to cook up the vegetables and pears which I love the flavor. Watching calories, while I don’t count them or nutritional facts I did do a quick check and this is a low calorie figure friendly soup. If I ever were to do a juice cleanse this would definitely be a soup I would add to it. On a raw diet, you can make this soup raw as well but I love the flavor from roasting and sautéing the vegetables and pear. I could go on and on about this soup and how could it get any better than quick, healthy, and pretty? Trying to simplify things this year and since it’s great hot or cold I like to make a batch, or two, and bottle it (freezing if making large batches I won’t drink within the week) and take it with me on the go! Hot I keep it in my Swell bottle (no affiliation I just love how it keeps things hot and cold) or glass bottles for cold soup or storage. I really didn’t mean to go on and on about how healthy and good this soup is for you. I had planned on just writing about how pretty it is and how happy it makes me, yep happy I just smile when I think about this soup and dance around as I sip it. Which just a word of caution, beets stain, not that this is anything new but just don’t wear your favorite new white tee while making it or get too carried away dancing while drinking it. Finding beets at a great price at Trader Joe’s, 1lb of organic beets for $1.69 vs the $2.49 I was paying at Whole Foods when I can’t get them at the market, makes me sing too! It’s still higher than I get the big 25lb bags of beets at the market for but since I can’t get them now and the ones roasted and froze are long gone it is much better. I still love the Love Beets I use to get at Costco that are already cooked and packaged and great for quick and easy salad but they stopped carrying them and I forgot how much a single pack is at the store so I’m trying to go back to roasting my own but we seem to eat them as quick as I cook them. I’m starting to think maybe I need to become friends with Dwight from The Office and getting my beets from him! Swirl of coconut milk, fresh thyme, fresh ground pepper, and or nuts/seeds if desired. *If wanting raw soup you can just blend ingredients together in a Vitamix or high-speed blender. If wanting a cold soup and it does not need to be raw I recommend still roasting beets and cooking before cooling as I prefer the flavors of the roasted veggies. Preheat oven to 350F. Wash and trim beets, poke with a fork, wrap in foil, and place on a pan to roast. Roast for 1 hour, or until just tender, as larger beets will take longer. When they are cool enough to handle peel and rough chop beets. Peel and chop onion. In a large stock pot heat oil and sauté onion. Peel pears, core, chop into chunks and add to the onions. Add in the beets and thyme (steam removed) and just stir the mixture around for a couple minutes. Put the vegetable mixture into a Vitamix, or high-speed blender/food processor, add grated ginger and broth. Blend using the soup setting (if wanting warm) until smooth. If you do not have a blender with a soup setting blend and pour mixture back into the pot (if wanting warm soup) and heat until desired temp. Just before serving stir or blend in coconut milk. If wanting cold just blend smooth, add coconut milk and blend until just combine. Top with additional swirl of coconut milk, fresh thyme, fresh ground pepper, and or nuts or seeds if desired. Enjoy! 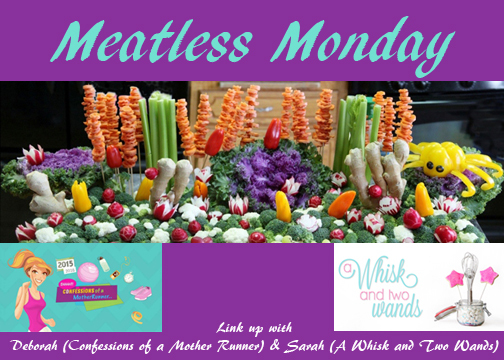 Since you can never have too much veggie love I’m also linking up with The Fit Foodie Mama, Annmarie for Meatless Monday! I love this! So pretty and vibrant! Thank you, it is and I can’t stop smiling when I’m eating it! I absolutely love Beets and am a big fan of Borscht. 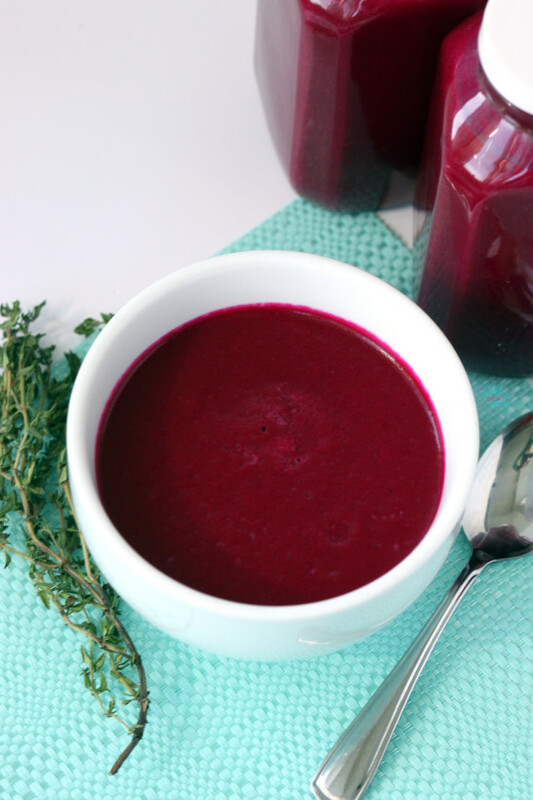 This recipe for Beet Soup sounds quick & easy & I will definitely give it a try! How anyone can’t love beets I will never understand! I hope you enjoy it as much as I do! Thank you! The pear is just enough to balance it out, oh it’s pretty but that won’t stop me from eating it! 😉 Cheers to Meatless Monday! You just made it even better with that pear!! Oooo beautiful beet love! Thank you! You can’t beat a beet! I have to say I am not a fan of beets, but this is just so darn pretty! What?! How can you not love the beautiful beet? Just kidding I understand we all have things we love and hate and beets are one of those foods. Thank you! I love, love, love beets. This looks amazing! Thanks for linking up! Thank you! Beets are my fav, how can you not love the beautiful color. Well I guess when it’s staining things but still I can’t hold it against this beautiful vegetable. Yum! I am always looking for new soup recipes so I am def going to need to make to save this one for make for our next snowy here not he East coast! Thank you! Oh yes this will brighten any snowy day, hope you enjoy it as much as I do! 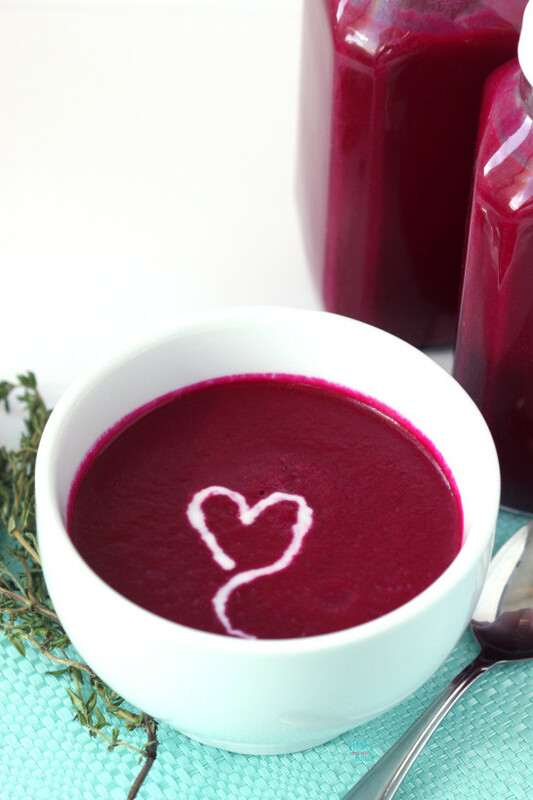 I have to say, I’ve never had beet soup, but now I want to try it. Love that little heart you put on there! Thank you! If you like beets and beet smoothies you hopefully will like this. It isn’t sweet but well balanced and I think it tastes as good as it looks. Hope you enjoy it if you try it! How delicious! I love, love beets too. Thanks for the pricing tip and thanks for hosting! Thank you! If you love beets this is a must make, I love it as much as if not more than a beet smoothie! Thank you for joining us! I’ve never made beet soup before! But this doesn’t look too complicated. It’s very simple to make. Just remember beets can stain, I often forget when wearing a new white shirt! well hello, new co host! I absolutely LOVE beets. The color always gets me! Hello! Me too the color is so beautiful it brightens any day! They are! Yes my husband likes it better warm and I can’t decide. You know i love this! right there with matcha! powerful bowls of nourishment. Oh yes! Whole food deliciousness at it’s best!